Lesson VII-5: Advertising Call my doctor if I my erection lasts longer than four hours? FOUR HOURS? Man, if that happens, I'm calling the Rockettes. Advertising is all about making things out to be black and white. But sometimes it's not enough to make your own product look good-you've got to go after the other guy. Accordingly, Hell's well-stocked legal department has filed a series of consumer lawsuits demanding new labels on our competitors' products, and then hit them with a false advertising charge, forcing them to negate key words of their product slogans. Unfortunately, the details are still a little mixed up. 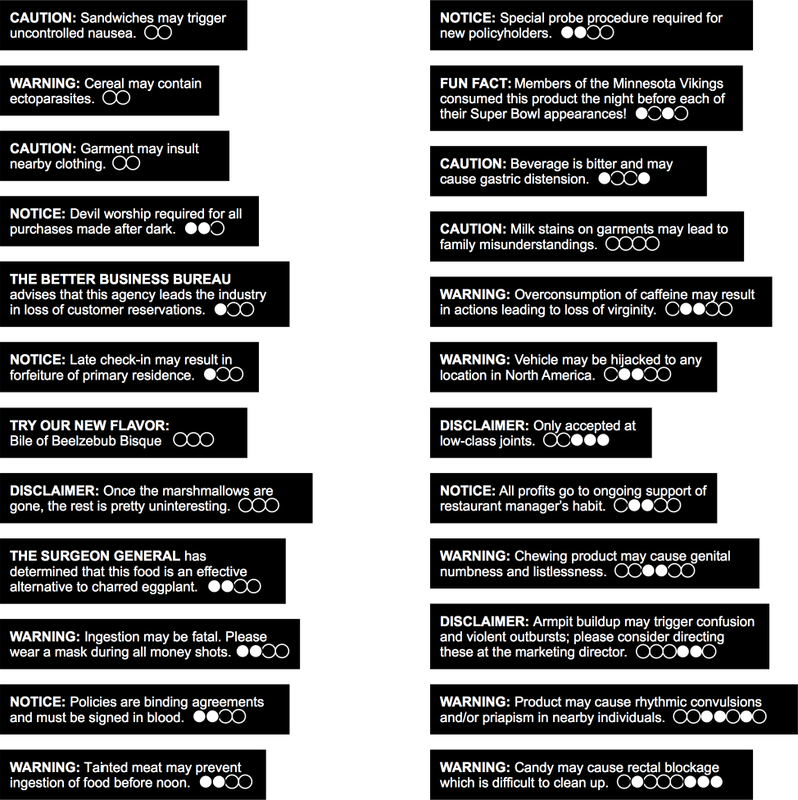 Using these warning labels and the diamond-shaped pieces in the handout, figure out the competitors' products and new slogans. The circles on the labels will tell you how many words are in each slogan and which ones were changed to their opposites. Then assemble the diamonds into a two-dimensional picture by lining up the diamonds so that each new slogan is formed by a series of adjacent triangles in a straight line. (The same word may be used in more than one slogan.) White corners will all match white corners, and black corners will all match black ones. When you're done, the resulting picture has a two-word name that our legal department would love.